1. Preheat the oven to 220oC gas mark 7. Open out the thigh fillets. Mix the oil with the sumac and lemon juice, and season. Rub this mixture into the chicken. Leave to marinate for 30 minutes. 2. Heat a baking tray in the oven until piping hot. Place the chicken thighs on the hot baking tray, then return to the oven for 12-15 minutes, turning the chicken over halfway through the cooking time until the chicken is golden and cooked through with no pink meat and any juices run clear. 3. While the chicken is cooking, mix together the yogurt, chilli, coconut, mint, red onion and seasoning in a small bowl. 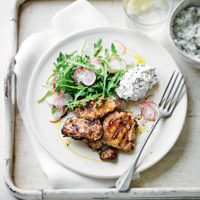 Transfer to a dish and serve with the chicken, and a rocket and radish salad.